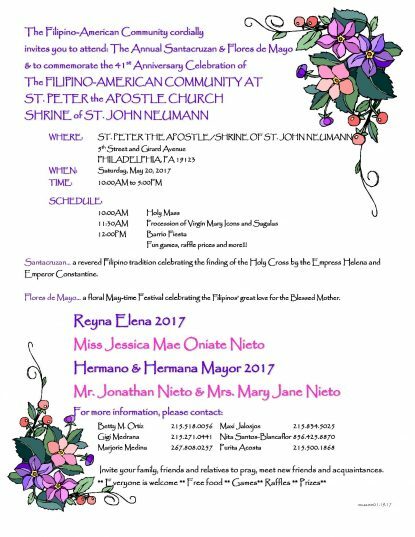 The Annual Santacruzan & Flores de Mayo & to commemorate the 41st Anniversary Celebration of The FILIPINO-AMERICAN COMMUNITY AT ST.
Fun games, raffle prices and more!!! Santacruzan… a revered Filipino tradition celebrating the finding of the Holy Cross by the Empress Helena and Emperor Constantine. Flores de Mayo… a floral May-time Festival celebrating the Filipinos’ great love for the Blessed Mother.